When I open Videowave and click on File/Open Production, the Open Production folder window opens (as it should), however, it constantly refreshes. This means that I am unable to scroll down to my directory(ies) that lie below what is immediately visible. If I try to scroll lower down the directory structure on the LHS of the screen, the refresh results in the default view being refreshed - in other words being taken to the top of my directory structure. As I am typing this, I can see the constant pulse of the refresh occurring (I have 2 screens). This is a little frustrating because I can't get to my productions location which is much lower down. This behaviour is not replicated in other NXT2 modules, so I this is a Videowave issue. My installationm environment is as clean as it gets: clean install of Windows 8.1, clean/new install of NXT2, 16gb memory etc. Is anyone else experiencing this issue? Any solutions? Does your antivirus have a registry cleaner/checker? Were they shut off while installing? Run a repair with everything shut down and reboot. I have Norton 360, and I have run its registry cleaner subsequent to the installation. So, let me do the reinstall, not run the registry cleaner and see what happens. Performed a reinstall, no luck, the constant refresh continues. If you have anymore suggestions, feel free. This is irritating, because, as I mentioned, this does not occur with other modules within NXT2. I can't duplicate your problem on my system, but I'm wondering if it's the "Folder Watching" function of Media Manager which is causing it. I have a vague but nagging memory of this sort of thing happening to a user way back in the days of Easy Media Creator. 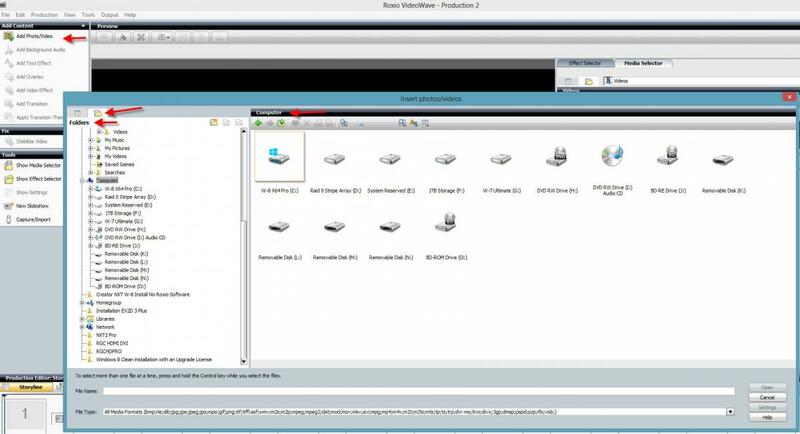 Try stopping Roxio Media Manager from monitoring your machine's folders, and see if that stops your problem. You can always restore the setting if changing it doesn't help. If you run Media Manager from the top toolbar of Creator NXT 2, Tools > Browse and Manage Media then go to the Media Manager toolbar Tools > Select Monitored Folders you'll see a 'Monitored Folder Settings' box. Uncheck the box which is labeled Start Folder Monitoring, and any other checkboxes on that page. Note which ones you change. Click OK, and then restart your Windows. Unchecking the box prevents the folder monitoring from starting, and restarting Windows clears the monitoring programs [Roxwatch15 and Roxwatchtray15] out of the memory. If this prevents your problem, no harm will come of leaving your folders unmonitored by Media Manager. If you want them monitored again, just reinstate the checkboxes and cick OK. Thanks for that. I tried it and it did not work. It's interesting that you can't replicate the issue. But maybe it highlighted a bug: under Monitored Folder Settings, I am unable to switch off "Start folder monoitoring" as you suggested. If I remove everything from the "Add folders to monitor" box, uncheck the 3 boxes underneath and uncheck "Start folder montitoring" (i.e. turn off everything in the Monitored Folder Settings" screen), click OK, then re open the "Monitored Folder Settings" screen, the "Start folder motnitoring" box is check marked by default upon opening. It does not matter whether I reboot or not. If I try "Add Folder", the pulsing/refresh directory tree returns. Of course, that window is built for idiots: it is too small to scroll down because of the constant refreshing and is a fixed size. This inability to resize windows that are too small has been prevalent for the last 3 or so versions of Roxio. I have owned them all, but let's deal with one issue at a time. I am at a loss. If you have any other suggestions, let me know. Thanks again. under Monitored Folder Settings, I am unable to switch off "Start folder monoitoring" as you suggested. I agree with you about the user interface of that window, however the action I described does stop folder monitoring, as long as you don't go back to that screen to check and inadvertently click OK with that box checked. The silly way it's written means you have to uncheck the box any time you look in that folder settings window. Would you please try this for me. -open the 'monitored folder settings' screen, delete the folders and uncheck the boxes, click OK. Don't open that screen again. -go check Videowave for that unwanted refresh. Please let me know the result. If the unwanted refresh is still there, then I'm sorry but it's not caused by the folder monitoring. However I do think this was worth trying. Thanks for the effort. Unfortunately, going your suggested route does not switch off the refresh in Videowave. This implies it is not folder monitoring. Let me perform a complete uninstall and reinstall to see what happens. Trying to resolve this issue brought up another issue which I am experiencing with NXT2 and have experienced with previous versions that I owned as well: as I mentioned, I have a dual screen set up, if I have iTunes open on the secondary screen opening Roxio Media Manager on my primary screen causes iTunes to minimize. As mentioned, this is consistent with the behaviour of previous versions (as is the the problem we are trying to resolve), combined with the fact that we had no updates for all of NXT, it makes me wonder how much effort Roxio/Corel is putting into the developement of this product. When I first read this, my feeling was that it is an issue with your video card software or settings. - as previously stated, I have been able to replicate this over several OS installs and Roxio versions. Regarding video card settings, let me install the latest Radeon beta drivers and see what happens. I am forming the view that there might be a conflict with one of my other apps. The solution would be to perform a clean install of Windowws 8.1 then install Roxio first (prior to anything else), but I am not sure I want to blow a Sunday just yet. I might leave that to the middle of winter. Thanks for the effort. Unfortunately, going your suggested route does not switch off the refresh in Videowave. This implies it is not folder monitoring. Thanks for helping us rule that one out. 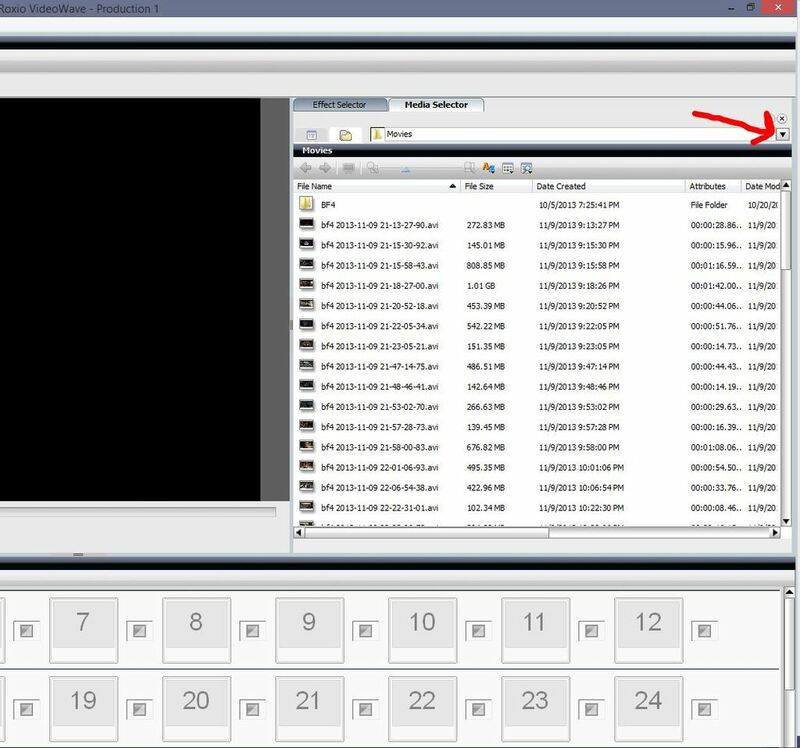 As a Workaround you can locate your VideoWave, *.dmsm project files with Windows Explorer then Right Click one and select Open. VW will then open and load that file. I am having the same exact issue, my videos folder is on one of my 4 HDD's and it's almost impossible to get to with the menu tree refreshing prematurely. Krug, What I did was to quickly switch to any other folder with the usual left click before the menu refreshes/closes and then open the menu again and then "right click" in the tree menu which seems to temp stop it from refreshing, this is not a perfect work around (and doesn't work every time) but I helps you be able to get to your working videos folder which you then can easily manipulate through the working folders window. PS: I will try to make a video of the issue occurring and upload it to YouTube and post it here (in my own thread) and send it to support for review. Thanks for your input. Both of your respective methods work. Unfortunately these are not entirely satisfactory solutions, but I need to move on. I buy Roxio each year purely for Videowave as this is the module that I find most useful. We travel for our vacations and when we return I compile a 20-25min movie/slide show on blu-ray DVD for family/friends. This both limits and reduces the pain inflicted on them by watching our vacation experiences. Videowave is intuitive and easy to use if you want to do something more sophisticated than a vanilla slide show. I have great fun with it. But the app has its quirks and idiosyncrasies which persist version after version. but I am trying to make the distinction between the marketing bumpf and real use. Batch convert and Transfer – Roxio needs something that approximates dbPoweramp (which I have). This is a no contest comparison as dbPoweramp wins hands down. Edit song information – this module can’t compare to what you get in dbPoweamp and the free MediaMonkey. Roxio’s Gracenote functionality does not work in the batch environment. Even if you try give it a hint (by putting in the album name for instance), its ability to identify the album and correctly name the tracks is hit and miss. And I am not entering metadata by hand. NXT has the potential to be a great product (even if you have to pay a little more for it) as I would prefer a single product for my multimedia requirements. It is the Swiss Army knife of multimedia applications and in using it I identify the functionality I require, but then I am forced to go elsewhere as NXT does not do them well. In NXT 3, I would like to see real progress. Maybe Roxio could use the money saved by not giving us $450 in “valuable” extras to fund the move to 64-bit, as this would require a rewrite and maybe we get a really good Swiss Army knife. Hi Kruginator, Since Corel now owns Roxio, you might be interested in this Suite of programs. VideoPhotoSuite 6. Guess where the development money might be spent. For Music, I use GoldWave. (free trial available). Is this what you guys see and call the refresh? I'm on W-8 Pro x64 running NXT Pro 2. Actually cdanteek, that seems similar but I have a drop down menu, and when it tries to drop down to view the folders the menu snaps closed just as it refreshes (very similar to what your showing there) making it nearly impossible to select ANY folder in the root tree. Again to want to apologize to Kruginato for jumping ion here as I don't want to muddy his original thoughts as he makes some very valid points, if it would be better for me to make my own thread please just let me know. Show me the drop down menu? Use Snipping Tool to capture screenshots applies to Windows 8.1. 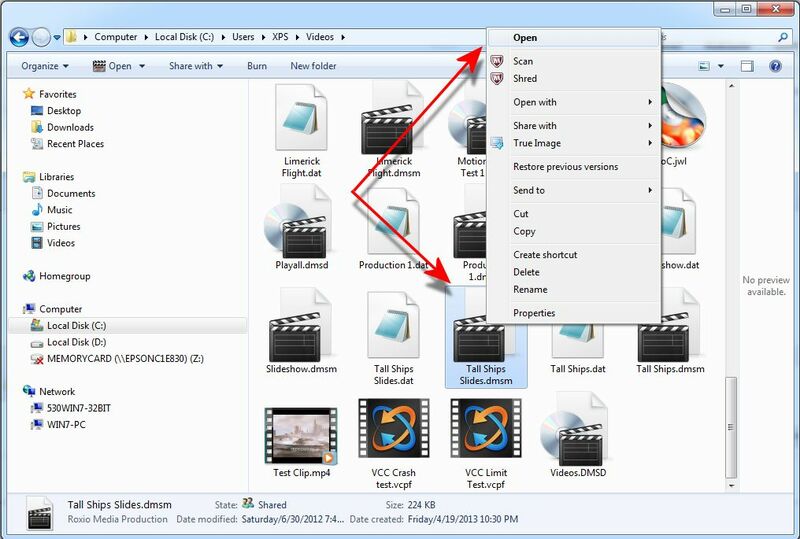 Here is the SS of the drop down menu that I use for selecting media folders: it snaps shut as soon as refreshes 1 maybe 2 seconds, IF you right click into another folder very quickly you can then hold right click and "sometimes" move to another drive folder. I have been using Video Wave all morning and afternoon today, and that refresh your showing in your video seems to be the direct cause of the problem, I just tried to save a project and I could not move the tree list to my desired save location as it refreshed back to "my documents" every time I tried to move the tree. No sense for all that off line jpg hosting, just attach it to your post! Yeah I know I usually do that, however for some reason I am unable to attach anything, I can barely type in this forum as most of my words are incomplete and I have to go back and retype most all them. It must be something t do with IE 11 because I can't use the link or image settings, the window pops up but are un-clickable for me. I see now with Media Selector Docked! IE is a festering pile of dog pooh, I use Fire Fox. For now use the Add Photo/Video, Folders, My Computer to locate and add your files. In IE 10 & 11 you have to toggle between editing modes to get things done... It has been reported but until they bring the site up to specs it remains a pain! Got it!! Thanks for all the help and suggestions cdanteek and JIm H, This should help a lot until this gets sorted out. I am not a fan of Firefox BUT is this case I would not blame you a bit!! !